Last week, we headed out on a drive from Bangalore to the much heard of Nandi Hills. I must say I was really disappointed with the venue – an overrated, grossly mismanaged hill fortress, bustling with annoying tourists and littered with plastic! 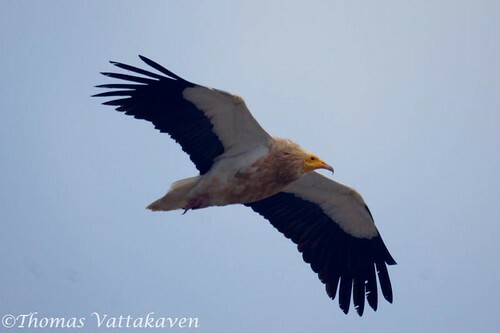 One thing though, more than compensated for it – Egyptian Vultures ( Neophron percnopterus)! These are small vultures, also called as the White Scavenger Vulture or the Pharaoh's Chicken. 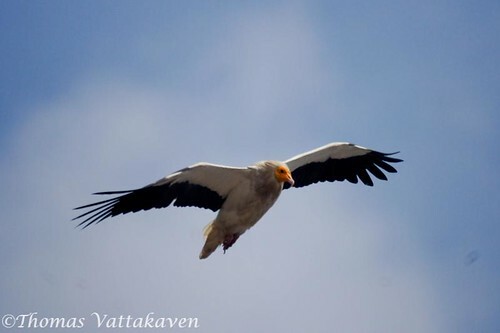 When it is soaring, its underwing black and white pattern and wedge shaped tail make it distinctive. 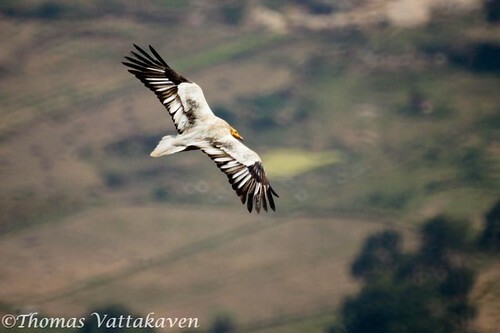 In Nandi hills we watched it as it soared above the topmost rock ledge, flying right overhead gracefully and giving me opportunities for some close up photography. 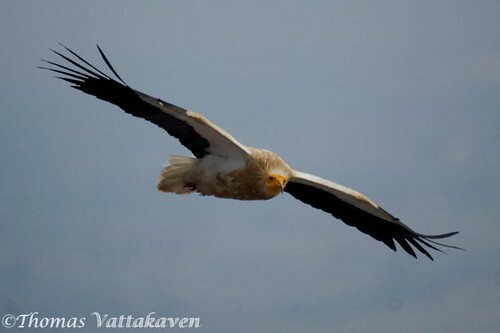 These birds have a white plumage with black flight feathers. 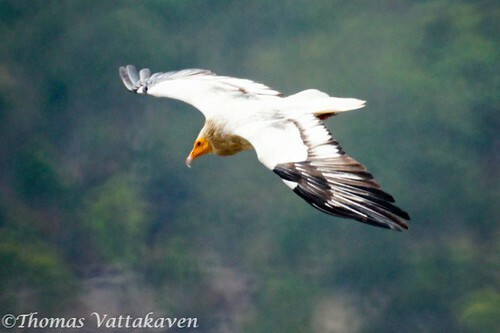 Their beak is pale or yellowish with a black tip in the Indian sub-species – ginginianus. In others it is black. 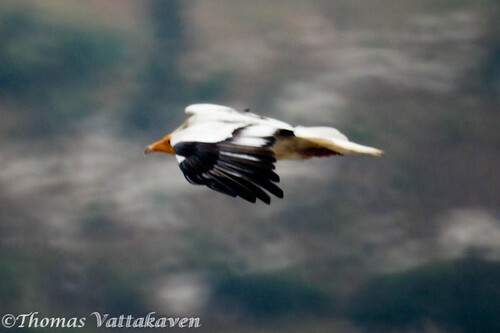 This species is often seen soaring in thermals often with other scavengers. 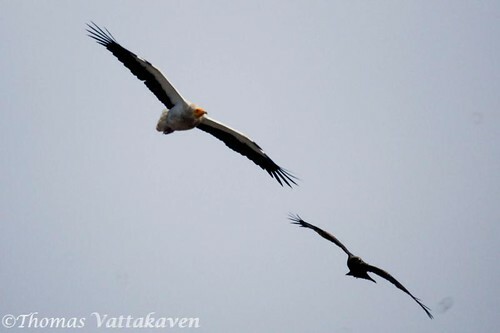 Above it is pictured with what appeared to be a black-kite (which was chasing it). The bird feeds on a wide range of foods such as insects, carrion, vegetable matter and live prey, but an interesting fact is that they are known to have a preference for faeces. Feeding on mammalian faeces is thought to help supply it with the bright yellow carotenoids that give it its facial colouration. However, they are most well known for their ability to eat eggs. They are the only birds known to employ tools – they use stones to help break open eggs by repeatedly striking at them with the stone in their beak. They roost communally but are monogamous and nesting sites are re-used. Their breeding display involves both partners flying high into the air and diving back down, grasping claws on the way down. 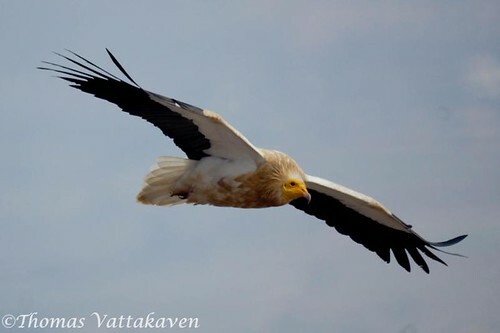 Although they have few natural predators, their population is severely declining across its range in southern Europe, in northern Africa, and in western and south Asia and they are considered an endangered species. 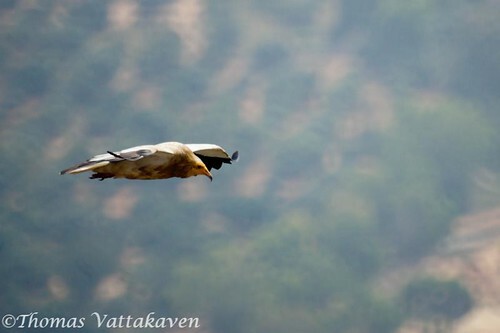 The next time you find yourself in Nandi hills, look above you head, you might just be lucky enough to spot the pair of Egyptian vultures that I saw.